In Touch mode, one uses the Eraser Tool to draw a red “touch” line. Any object that the line touches will be deleted when the stroke is finished. To enable Touch mode, click on the icon in the Eraser Tool-Tool Controls. 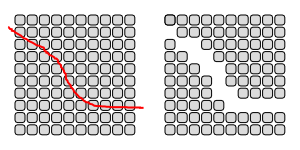 Left: The Eraser Tool has been used to draw a red “touch” line over an array of Rectangles. Right: Objects the “touch” line crosses are deleted.